If you’re looking for signs of our collective robotic future, it’s either terrifyingly near or forever just around the corner. While debate on military robots heated up this month thanks to UN talks about the development of lethal autonomous robots—and military robots are evolving quickly thanks to defense budgets—household robots remain far from ubiquitous. More than a half-century after the world’s first industrial robot, Unimate, began work at a General Motors plant, most commercial robots still work in factories. The ones that are in households, such as the roughly 10 million robot vacuum cleaners led by iRobot’s Roomba, have usually been limited to performing one task only, like sucking up dirt. Computers and robots can beat us at dedicated tasks like chess or painting cars, though humans still have a massive intelligence advantage in terms of general knowledge. That’s a good thing if you fear a robot uprising. Not so great if you’re waiting for that perfect humanoid robot servant from science fiction films, like a C-3PO. While Hitachi doesn’t have plans to commercialize Emiew 2 yet, it believes the technology could be used in machines that provide automated tours of venues like museums or exhibition halls. Another humanoid machine that’s designed to operate in everyday environments is NAO from France’s Aldebaran Robotics. 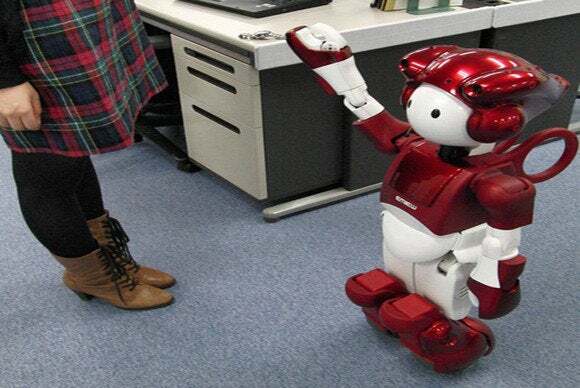 Engineered to be a “friendly companion around the house,” NAO is only 58-cm tall and has a toy-like charm as well as sophisticated sensors such as a sonar rangefinder and face-detection algorithms. Thousands of NAO robots are being used in schools and universities in dozens of countries, and it’s also a standard platform for RoboCup robot soccer tournaments. But there are several obstacles preventing NAO from becoming a must-have gadget in the consumer market. One is cost. 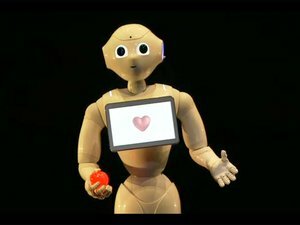 While NAO is already impressively cheap for a sophisticated humanoid, it still costs around US$10,000. That price will likely fall as more are produced, though NAO’s small stature means it may be seen as an expensive plaything or partner rather than something that can perform useful tasks such as housework. Consumers also need to be comfortable with NAO recording what they say and sharing its language queries with a cloud-based database, as Nicolas Rigaud of Aldebaran recently told the RSA Conference in San Francisco. So what robot can you call to clean up your messy bedroom? Well, open-source robots can do the job—when controlled by a human. A sped-up video on YouTube shows how the two-armed, wheeled PR1 robot at Stanford University can tidy up a mess, albeit slowly and with a person at the remote controls. Other videos by roboticists have shown how PR1’s successor, the celebrated PR2, can autonomously take on drudge work such as folding laundry or even fetching a beer from the fridge. PR2, though, doesn’t come cheap. California-based developer Willow Garage has put a $280,000 price tag on the hulking, Microsoft Kinect-equipped machine. That’s way more than anyone would spend on a housekeeping droid. Some researchers are exploring the middle ground between purely self-contained, autonomous robots and ones that work with humans. Telepresence robots are designed to project a human user’s presence into a remote location, eliminating the hassle of travel. They may be little more than glorified webcams on wheels, but telepresence robots are being billed as a richer form of interaction than a phone or conference call. Visiting a factory in China via robot to view a product prototype is one potential application. Others are closer to home. Both are autonomously navigating wheeled columns topped by HD displays that show the remote human operator’s face. Doctors can talk to patients through RP-VITA, which received approval from the U.S. Food and Drug Administration last year, or direct others during emergencies such as stroke treatment. The AVA 500 can serve as a teleconference vehicle, but equipped with a robot arm or other tools, it could act as a remote security guard, cargo bot or factory inspector, with or without telepresence functions. Robots have been transforming factories for decades, but to protect workers they’ve usually been confined to no-go areas for people. Recently developed collaborative robots, or co-robots, are meant to work alongside people, either on the factory floor or in everyday environments. “We are still some years away from having a robotic laundry system (from hamper to wash, dry and folding and then back into the hamper), bathroom cleaning system (other than the floors), and general home clean-up robot,” Frank Tobe, editor of The Robot Report website, wrote in an email. “But we are closer to service robots in rehab/nursing/full care centers which provide medical monitoring, physical assistance, physical therapy and remote presence communication. These inventions will take years of trial and improvement funded by agencies and centers before that trickles down for home/personal use, but clunky versions are being field tested in Europe and Japan,” Tobe wrote. Robots are coming out of the factory and moving beyond their beachhead in homes toward hospitals, offices, schools and workplaces. It’s essentially a matter of regulations, cost and time.